The Uncensored Radio Show known as Cigarette Butts & Bandanas made its debut and it didnt disappoint. Talking everything from classic CB Radio Moments to creating some moments that made most of the chat room go “Wow”. Catch all of the R Rated Entertainment as Cigarette Butts & Bandanas Debuted on the Wild Talk Radio Network. OTL for Nov. 20: Comic to Movie, Part 1? This week with Stage taking the week off (We’ll have all three back eventually) Spug and Omega went over the act of transferring one geek material to another media, specifically comic books and the like into movies. We assault Spider-Man 3 again, discuss rumors on #4, and trash on Mortal Kombar Anihilation and the travesty it was. There’s a lot more, comics to games, games to movies, so with the crew off for Thanksgiving will we come back to this topic again another time? Author otakutalkPosted on November 21, 2008 Categories Entertainment, Otaku TalkLeave a comment on OTL for Nov. 20: Comic to Movie, Part 1? Omega got toy collecting, Spug got miniature collecting, so tonight was the newest host’s chance to share his passion, and it’s video game night. In a largely Spug-free episode, Stage shares his opinions and favorite games, as a storytelling media, and the game series that have stood as the foundation of the industry (unlike single, more recent games like Dawn of War). It’s a two and a half hour game fest, followed by an off-topic encore with Spug. This week on OTL, Spug, Stage & Omega talked about well, in a word, nothing. As instead of talking about a show topic, the OTL Crew basically talked about the first or second thing that popped in to their heads at times and basically let things fly on this edition of OTL. As if Seinfeld can have success with a show about nothing, so can Otaku Talk Live, so check out all of the excitement of this week’s edition of Otaku Talk Live. With Tim Stein taking a break, Wrestle Talk Radio handed the captain’s seat over to one of the long time listeners of the program, Nick. Some of the subjects that Nick covered on the program included the last couple of weeks in the world of WWE and TNA Wrestling, also covered some of his dislikes with the current product as well. Also, along with WTR Usuals, Spug & Omega, they broke down what they would do to help fix the current Wrestling Product. 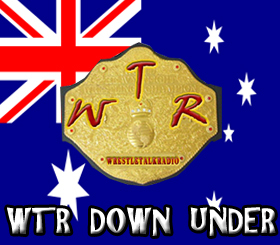 Listen to all of that and a bunch more on the latest of Wrestle Talk Radio.